Both hypervisible but invisible: Hannah Greenstreet reviews a set of nine monologues by Muslim women from across the world. Hijab Monologues London at the Bush Theatre. As the cast line up in front of Khadija Raza’s simple, boxy set, I realise that, apart from Cuttin’ It by Charlene James, I have never seen one woman wearing the hijab onstage, let alone six. 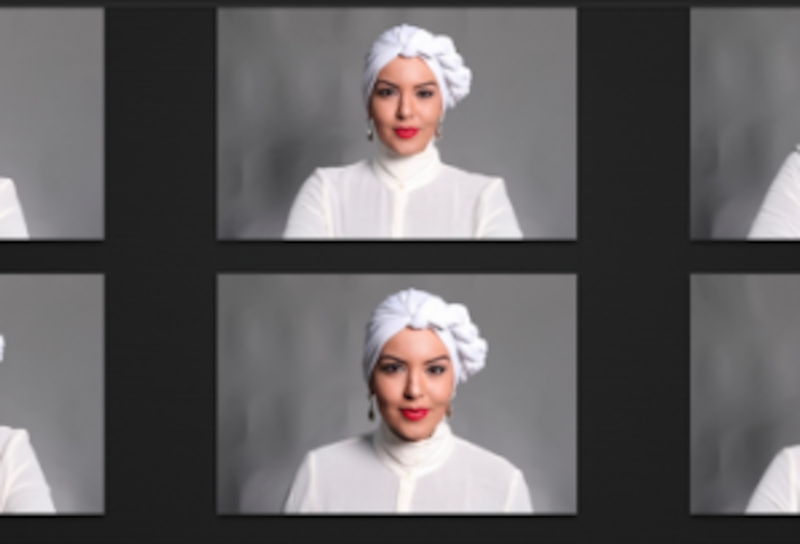 The diversity of the characters’ experiences as Muslim women in the West is conveyed not just through their words but their costumes, often playfully; in the first monologue, Hoops, the character talks about trying to match her hijab to QPR’s blue and white colours to go to a football match but only having a white scarf. The stories shared are funny, angry, joyful, poignant, contemplative, by turns (sometimes all at once). Across the monologues, threads of common experience emerge: being stereotyped; fear of racist attacks; being both hypervisible in a hijab but not really seen. The latter, in particular, makes Hijabi Monologues a powerful piece of theatre. By standing onstage, the performers invite, almost dare, the audience to look at them, but they take back control of their representation by shaping our looking; it made me reflect upon how I perceive women who wear the hijab or niqab outside the theatre. In ‘New Ways of Looking’ by Nimmo Ismail, the character talks about how she likes to people watch on the tube but has had to stop doing it because now people regard her with suspicion. In ‘Hijabi Spiderman’ by Amal Abdi, one of the funniest and most hard-hitting monologues, the character informs us she’s a superhero but now her job is staying alive, having lost her powers of invisibility. She fears that someone will push her off a tube platform into the path of a train because of how she looks. A key part of the Hijabi Monologues project is community engagement. Hijabi Monologues, originated by Sahar Ishtiaque Ullah with co-founders Zeenat Rahman and Dan Morrison, was first performed in America and has since toured around the world. Each performance incorporates monologues from local Muslim women. The Bush Theatre held an open call for monologues and an open casting call. The result roots the production in place and creates a genuine sense of community. This community is modelled onstage by how the performers interact with each other in between monologues: helping change costumes; a supportive hand on the shoulder; swapping a joke. As a West Londoner, I felt a buzz of recognition when ‘Hoops’ by Sahar Ishtiaque Ullah and Ellie Horne recounted a football game between QPR and Brentford, even though I’m not a football fan and I’m from Ealing. Seeing yourself represented onstage, particularly when you face a lack of representation or are routinely misrepresented, can be a very powerful thing. As a white, atheist woman, I can only imagine what it must have felt like to watch the show as a Muslim woman. For me, watching Hijabi Monologues London challenged assumptions about hijabis that I was not conscious I held, and did so in an uplifting and very generous way. Hijab Monologues London was performed at the Bush Theatre. Click here for more details. Hannah is a writer, academic and theatre critic. She is London Reviews co-Editor for Exeunt, with a focus on fringe and Off-West End theatre. She is researching an AHRC-funded PhD on contemporary feminist theatre and realism at the University of Oxford. She is also a playwright and has worked with Soho Writers' Lab, the North Wall Arts Centre, and Menagerie Theatre Company.